The Congress on Tuesday attacked the Narendra Modi government for its failures during the past three years and said that an "atmosphere of intolerance" is being created across the country. 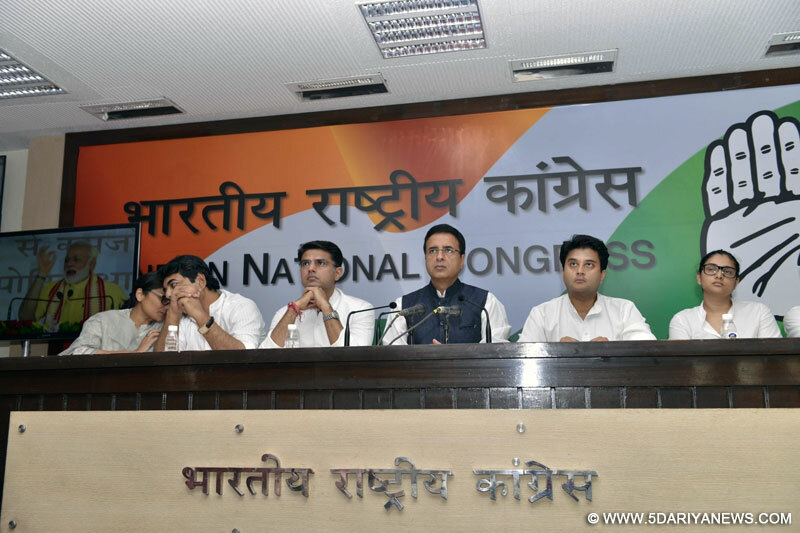 "This government weaved a dream of bringing 'Acche Din' and doing something new when it came to power in 2014," Congress leader Jyotiraditya Scindia said at a press conference here. "Instead of bringing the 'Acche Din', they shattered the dreams of 125 crore people of the country," he said. "There is an environment of intolerance in the country, and if anyone raises his/her voice or debates it, then they are branded anti-nationals," Scindia said.Scindia also accused the government of forcing on the people to what to learn, what to read, what to eat and what to wear. "This government is trying to push its policies based on a regimented thinking," the Congress leader said, adding that under this regimented thinking it formed anti-romeo squads and harassed people. He said an "anti-Dalit kind of atmosphere is being created in the country", where this government calls a session to celebrate the Ambedkar Jayanti, and hold a programme in Mau, Uttar Pradesh, and in London. "But on the other hand, their people are harassing the Dalits across the country everyday," he said. "From my state (Madhya Pradesh) 50 people belonging to the Dalit community have expressed their desire to die," he said. "Big programmes are organised for them, but the Prime Minister (Narendra Modi) wants Dalit-Mukt and Adivasi-mukt Bharat," he alleged. "The death of Rohith Vemula and the beating of four Dalits in the name of protecting cows in Gujarat's Una are a stigma on our society," he said. "And their leaders and ministers define these incidents as good for the society," he added.